Hmmm… I feel I should really apologise for the lack of any posts that have happened recently. Between observing trips, conferences, deadlines and some much needed rest to spend time with a certain special someone, I guess I’ve been a bit lax with any blogging shenanigans of late. I should remedy this. And what better remedy than a big pretty infrared image of some dust! Just look at that. Isn’t it beautiful? A friend showed this to me the other day (she has it set as her desktop wallpaper). This is a composite image taken by the Planck satellite. Planck was put into orbit last year to study the cosmic microwave background. In doing so, however, Plank operates at precisely the right frequencies to pick up emission from cold dust. 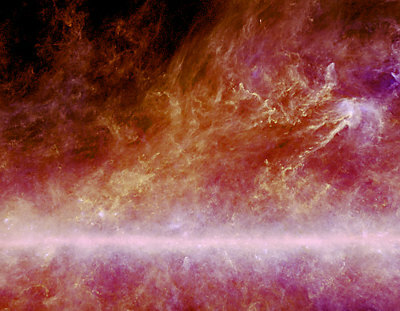 This, then, is an image of the huge swirling vortices of cold dust that engulf the Milky Way. Or some of it, at least. It’s also interesting for someone like me who studies interstellar space. I’ve written about the diffuse interstellar bands before. A few hundred spectroscopic absorption lines which tell us, essentially, that space is full of stuff. ** We don’t know precisely what that stuff is, but it’s literally in every direction we look. Just like this dust. Actually, the diffuse bands show a fairly close link to dust. More dust tends to mean stronger absorptions. In particular, there’s a good match between the density of dust and one absorption line just outside the range of visible colours at around 862 nanometres. Imagine the deepest red colour you’ve ever seen. 862nm is a colour a little bit redder than that. Whatever the interstellar stuff is, it has something to do with dust. And images like this one from Planck really do make it quite apparent how much of that interstellar stuff there might be out there! *Actually, some friends of mine have taken to ignoring me when I use phrases like “So what about dust, then?” in sciency conversations. **And yes, that’s the technical term for it. This entry was posted in Imported from Livejournal and tagged diffuse interstellar bands, dust. Bookmark the permalink.